We all know the usual Superbowl fare: wings, burgers, and loaded nachos. If you need cholesterol, you know where to go. But here's the deal...you really don't have to worry about not being able to eat at a Superbowl party. I've compiled a short list of tips and recipes to ensure that the big game will be enjoyable and delicious. If you're going to a friend's party, all you have to do is take one or a few of these different, easy-to-make, and budget-friendly recipes. They sure are tasty. Just make sure that you bring enough of each because everyone is going to want some. If you're feeling lazy, just take store-bought chips and salsa. If you're having your own party, my favorite idea for food is to have a nacho or taco bar. That way everyone can pick whatever toppings they want. You can have all different kinds of beans, veggies (tomatoes, onions, bell peppers, jalapenos, etc.) 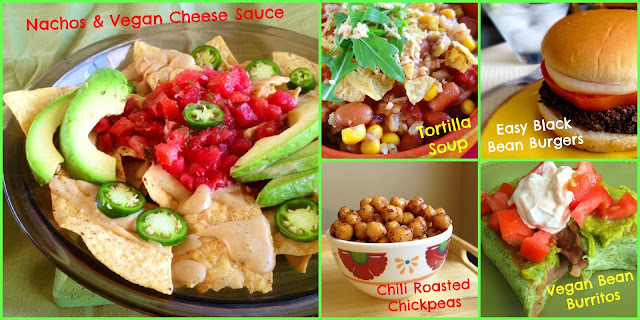 , salsas, and vegan cheeses. Another quick and easy idea is chili or tortilla soup. Throw all the ingredients in your crock pot the morning of and let it cook itself, or make a quick batch on the stove in about a half an hour. The bean burritos are also a delicious option. You could always include them in your nacho/taco bar. I'm gonna go out on a limb here and say that all of this food will be gone before the party ends. Have fun, and enjoy the last NFL game until preseason starts in August.